The 10 Best Portable Solar Car Battery Charger kits. Source – ACOPOWER. Portable solar car battery charger uses solar energy as the source of power. There are many advantages of solar power over conventional power sources like fuel because solar energy is clean. This means that it does not pollute the environment. What’s more, solar energy is free once the installation costs have been met. To convert sun rays into useful power, one needs a solar panel. This principle is no different when it comes to solar car battery chargers. How Does Solar Car Battery Charger Work? The portable solar car battery charger uses the sun as its source of power. Usually, the charger has a solar panel that is portable, and you can place it on the dashboard or the roof of your car. Regardless of where you place it, make sure there is enough exposure to sunlight. The solar panel converts the sun rays to DC which charges the car’s battery. The charger comes with alligator clips which you clip to the terminals of your battery. You can also charge your battery through the cigarette lighter port in your car. There are usually two types of solar car chargers that are on the market. The first solar charger has a regulator which controls the charge that goes into the battery. The advantage of the regulated solar charger is that it prevents overcharging of the battery. The regulated battery chargers are used to ensure that your car battery does not drain when you leave the car for long periods of time. 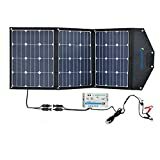 The second type of solar charger does not have the regulator. Any solar car charger worth its salt should come with a mechanism to prevent your battery from overcharging or discharging. Some have a regulator that prevents overcharging. For other brands, you have to set the current that you want to flow into your battery. You might find yourself in a situation where you need to move the solar panel of your charger a long distance. A charger that comes with long wires and connectors is very ideal for such situations. The long wires will enable you to place the panels in the optimum position. There are solar power panels that have a high resolution and can covert the light to power even in an overcast sky. Ideally, all solar panels can do so, but their power output is greatly reduced. 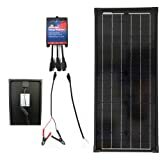 You should buy solar battery chargers that are designed to work in low light situations. One of the greatest advantages of the solar car battery charger is its portability. You practically move with it wherever you go and can charge your car battery on the move. Another advantage is that the charger does not require an external source of energy, unlike the electric charger. This makes it cheaper since you do not incur additional electricity costs. With proper usage and maintenance, the charger is guaranteed to give you service for a long period. Since you can use the cigarette port to charge your battery, you need not to worry about fixing the alligator clips to the battery terminals- just plug the charger in ad off you go! Most solar powered chargers charge slowly which is a good thing right? Yes right. You see, when a battery charges too fast, a lot of heat is generated which reduces the shelf life of the battery. In extreme cases, rapid high voltage charging may cause the battery to explode. 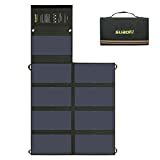 As earlier mentioned, the solar chargers use the sun which is readily available, and you will not need any specialized equipment to charge your battery. This makes charging your battery very easy and convenient. The case is different with an electric charger as you would have to look for a power source to do the charging. Let’s have a look at the 10 best solar car battery chargers. Has SAE connector for pre-wired Zamp Solar RV or Campers; for other adapters, contact ACOPOWER. Matching power bank generator with DC/AC inverter for laptops, search ASIN: B01N19GOYJ 400Wh. Perfect Charging Pack to Bring Quick Charger Anywhere there is Sun. This is item is 20W 18V with battery clips, can charge the 12V battery directly, it will output max 90% power in the sunny day. As we know the source of the earth is decresing fastly, however we also can use the solar panel to produce the electricity in the sun, it is so amazing. Waterproof and light design, let the solar panel easy to take outdoor, you can take it to camping, hiking, and travel. This is also a good item to teach kids how magic the sun is, and how can we save the sources of the earthy. Four Corner Protectors protect you from scratches & cut from sharp metal corners. Kit includes 50w SuperBlack panel, 7amp controller, battery clamp adaptor and bare strip adaptor. Panel dimensions are 31 inches x 14 inches x 1 inch with weight 6.4 lbs. 25-Year Warranty and No Sales Tax to You. 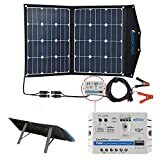 Fast Charge: The solar panel charger with A+ level solar panel optimal efficiency and built in icGEEK technology, with which it detects and charges the connected device with optimal current in direct good sunlight. Highly Portable: Compact size unfold 21.45in x 9.84in x 0.2in, folded 9.84in x 7.1in x 1.5in and lightweight 825g(21.9oz), easily carry in your bag or hang on your backpack, also with a adjustable stand to win a better sunlight angle. Wide Compatibility: USB output ports, compatible with all 5V USB charging devices including smartphone, bluetooth headphone, Gopro camera and power bank to stock solar energy as backup, DC output compatible with battery chargers, battery pack etc., and solve your car battery Emergency. 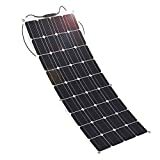 Durable: Waterproof nylon fabric and laminated solar panels protect your panel from rain or wet air, built in regulator and over-protections keeps your charging device safe and prolong its life. Kindly remind: Keep your cell phone or device not in direct sunlight or put it in the shadow created by the panel. Use the panel in outdoor direct sunlight to enjoy better performance, in the room or inside the window glass sunlight is much weaker makes panels weaker or not work. Some Apple product need original cable or cables with MFi licence to be charged, or it will show not matched. Size: 119x54x0.25cm/46.8x21x0.1 inch, weight: 1.9kg/4.1lb. 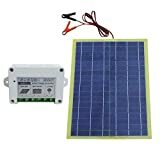 The 100W monocrystalline solar panel is lightweight and easy to transport, hang, remove and storage. Easy installation, it can be affixed by glue, adhesive, grommet, tape or velcro. Holes on panels are pre-drilled for fast mounting and securing, perfect for non-permanent installations. Package: Giaride 100W flexible solar panel, user manual, 18 months warranty and friendly customer service. Notice: Although the holes of panels was plated with a layer of corrosion resistant material, it is better to make some protection for the holes to prevent the grommets on the edges from rust if you use the panel on the boat. Because the seawater is corrosive. 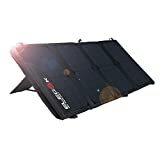 Fast Charge: This folding solar panel is made of top brand SUNPOWER high efficiency solar cell and built in icGEEK technology, with which it detects and charges the connected device with optimal current in direct good sunlight. 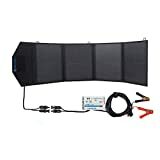 Easily Portable: This panel can be folded as a briefcase with compact size 11.8in x 11.8in x 2.3in while unfolded 42.5in x 23.6in to collect more solar energy, and lightweight 1632g(57.56oz), easily transport and hang on your tent RV with buckles included in, or spread flat to collect solar energy directly. Wide Compatibility: USB output ports, compatible with all 5V USB charging devices including smartphone, bluetooth headphone, Gopro camera and power bank to stock solar energy as backup, DC output compatible with laptop, battery charger, battery pack etc., and solve your car Battery Emergency. Kindly remind: Keep your charging device not in direct sunlight or put it in the shadow. Use the panel in outdoor direct sunlight, in the room or inside the window glass sunlight is much weaker makes panels weaker or not work. Some Apple product need original cable or cables with MFi licence to be charged, or it will show not matched, some laptops request certificated charging source via its built in software makes not charged by solar panel, please confirm with the manufacturer before using. The portable solar car battery charger is not only effective, but they are also efficient. With the ease of portability and use, it makes sense to grab one for yourself. With a solar car battery charger, you no longer have to worry about your car not starting due to a low battery.